It started out as a social enterprise to help senior citizens with time on their hands to earn a bit of pocket money. But now business is booming for The Social Iron - a programme which sees them paid $1.50 for every item of clothing they iron. Since the group was featured in The Straits Times Causes Week last December, it now has 40 regular customers - four times as many as when it started. Causes Week returns this year for the seventh time, from Dec 17 to Dec 23. 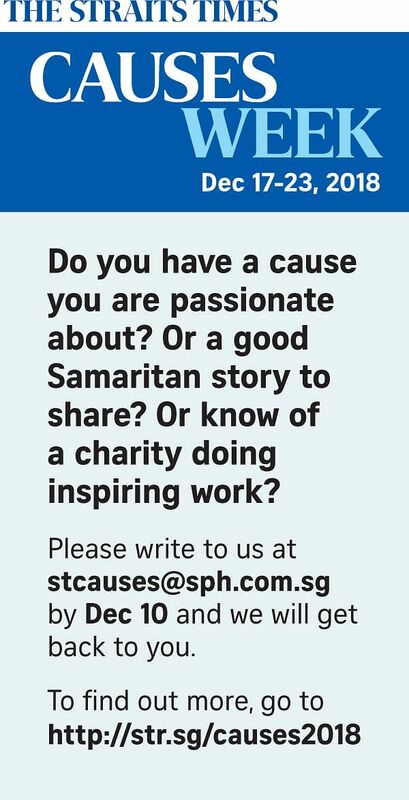 Anyone with a story or cause to share for the betterment of society can write in to be featured in The Straits Times. Said Straits Times editor Warren Fernandez: "The aim of our Causes Week is to shine a light on the work of those groups that have been quietly working to help others in the community. "We hope that doing so will help them draw support and resources to further their good work. As we head into the year-end festive season, it is a good time to reach out and lend them our support." The Social Iron expanded from six members to eight and has three delivery drivers. From ironing about 100 items a week, the group now presses around 250. The seniors do the ironing from the comfort of their homes in the east and north-east regions of Singapore. Madam Lum Lili, 63, a retiree who joined the group after reading about it in The Straits Times, said that ironing gives her something to do during the day. The former bus interchange road master irons about 70 items of clothing a week. "Getting feedback from the customers who say that my ironing is excellent makes me happy," she said. Mr Darren Wong, 36, who founded the group, said: "We've had new customers come in since. More customers benefit the seniors who get more meaningful work to do." Mr Wong is exploring how the programme can be further expanded. Recently, the group collaborated with the Sasco Senior Citizens' Home, a charity that provides lodging and care for the elderly, including senior activity centres, in an effort to include more seniors. With the partnership, the social enterprise now has a dedicated space at Sasco's Senior Activity Centre in Compassvale, where they can train seniors who are keen to take part but may not be confident in their skills. Do you have a cause you are passionate about?